The Autistic Self Advocacy Network and Not Dead Yet are leading a National Day of Mourning on March 30th when disability rights advocates in cities across America will be holding vigils and memorial services to honor the lives of disabled people murdered by their families and caretakers. 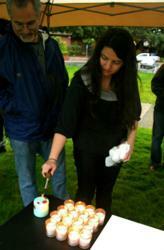 Zoe Gross and her father light candles at March 16 vigil. Zoe Gross, Autistic Self Advocacy Network. Disability rights advocates in cities across America will be holding vigils this Friday, March 30th to honor the lives of disabled people murdered by their families and caretakers. This nation-wide Day of Mourning is being organized by the Autistic Self Advocacy Network(ASAN) and Not Dead Yet in response to the murder of George Hodgins, a 22-year-old autistic man, and the media coverage that the organizations describe as "sympathetic" to his murderer. On March 6, George Hodgins was reportedly murdered by his mother in Sunnyvale, California. Elizabeth Hodgins killed herself after fatally shooting her son. The Santa Cruz Sentinel referred to Ms. Hodgins as “a devoted and loving mother.” The Mercury News coverage appeared focused on the stress Hodgins' mother underwent as a parent of an autistic child. "Some articles asked readers to put themselves in the shoes of the murderer," said Zoe Gross, a member of ASAN, "but no articles called for empathy for the murder victim, who died knowing that his own parent had chosen to kill him." ASAN held a vigil for George Hodgins in Sunnyvale on March 16th. During the vigil, mourners read a list of names, beginning with Tracy Latimer, a disabled teenager killed by her father in 1993. (R. v. Latimer, 2001 SCC 1,  1 S.C.R. 3.) At the same time as ASAN’s vigil was being held, Tracy’s father was speaking on a television panel on Canadian Global News, arguing for legalizing the killing of disabled people - in the name of "mercy." The television program was followed by an online liveblog, during which Canadian Global News continued to promote Latimer’s views. Not Dead Yet, a national disability rights group opposed to euthanasia, and other people with disabilities participated through online discussion to challenge Latimer and his fellow pro-euthanasia panel members in a debate during the online blog. ASAN and Not Dead Yet have declared a National Day of Mourning in response to George Hodgins’ murder, Robert Latimer’s television appearance and what they describe as "the broader trend of sympathetic press coverage for people who murder their disabled family members." On March 30th, disabled people will come together in cities across America to hold vigils and memorial services to honor murder victims with disabilities and to demonstrate to the community that the lives of disabled people have value. Vigils will be held in cities including Los Angeles, New York, Tampa Bay, Fort Worth, Chicago, Boston, Portland, and Washington, D.C. A complete list of locations and times of Day of Mourning vigils can be found at ASAN’s website, autisticadvocacy.org.